Acer has just announced yet another tablet at it's New York Press Event, the Acer Iconia A1. 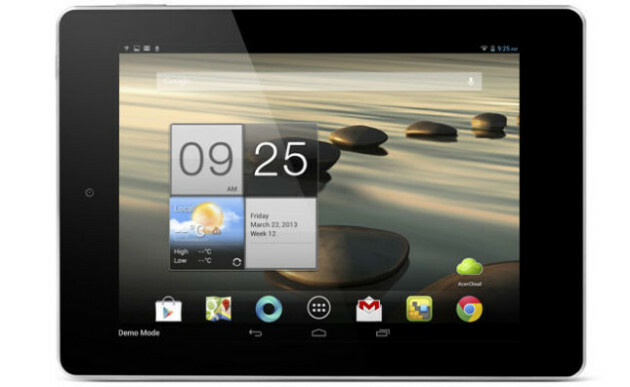 The same Android tablet leaked by a French retailer a few weeks back. It's going on sale in the US later this month for $169 for the 8GB version. Yes you heard that right, $169! $199 for the 16GB version. Spec-wise, it measures 11.1mm thick, runs a 1.2GHz quad-core processor from MediaTek, and is topped off by a 7.9-inch IPS display with 1,024 x 768 resolution. Pretty decent specs for a budget friendly tablet. It also has 8 or 16GB of internal storage, as well as built-in 3G. As originally posted by wicked over at AndroidTablets.net. Is somebody has an opinion about this A1 model ? I wonder does this tablet have a faulty emmc as well? Sorry, but what is an 'emmc' ? I just bought the A1-810 a couple of weeks ago. It's my first tablet, though I use an Ipad 4 for work ( not by choice). So far it's been a real pleasure to use. The tablet seems quite responsive, I've watched MLB games, Netflix, Hulu+ and Crackle movies on it, as well as movies I've transferred to the 32gb microsd card that I bought for it. All work fine and look good imo. Because of its dimensions you do get a black bar on top and bottom of videos, but that's to be expected, and I do appreciate the size for web browsing and reading Kindle books. This tablet is a bit heavier than the Fire or Nexus 7 and the Ipad Mini, but I've never used those tablets, and this is just fine by me. I do wish the back was rubberized, as it's slick plastic, I'll be buying a case soon so less chance of dropping. The bluetooth feature works great, I've easily paired up a Plantronics M50 earpiece, and also an old Rocketfish stereo bluetooth headset to it. The Acer has a gps receiver, which I haven't tried yet and don't really care about, I already have a good gps unit for travel. Battery life seems really good, although I haven't pushed it with video too much. The other night I watched Live Free or Die Hard on the tab, starting the movie with about 75% battery life, and it still had about 50% left after the movie ended, and this was with the use of bluetooth headphones too. No scientific method to be sure, but I'd wager that I'd be able to watch 3, maybe 4 full length movies before running out of juice. All in all, I like this tablet, and Acer in general. I'm typing this on a 3 1/2 year old 17" Acer laptop, which still works perfectly (replacd battery last year), and I also use a 2 year old 11.6" Acer AO722 netbook, whose hard drive I replaced with an ssd, it too works fine. So yes, I'm hopeful with this tablet. Last edited by Doume; 08-04-2013 at 02:33 AM. can the internal battery be replacd on the kindle fire? does crackle work on acer iconia a1?